He’s royally bred boys and he’s dang good to boot! His sire, dam and full sister are all Denver Champions. There isn’t a bull in this book that has a better pedigree. 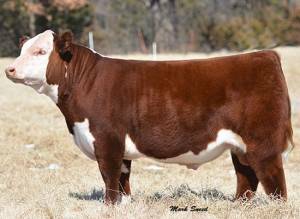 He has all the look and design you want in a cross bred bull yet puts it all together in a PB Herford package. Line up, this is one you’re going to want to get in on!